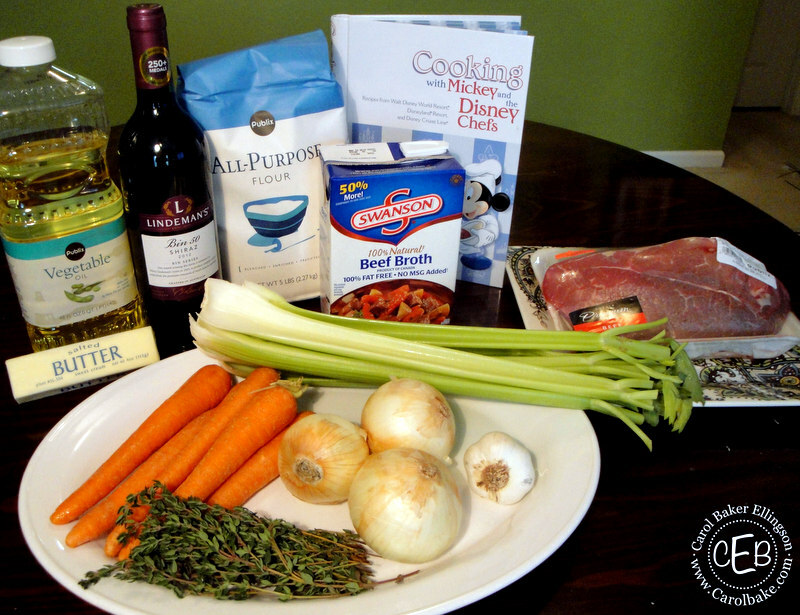 Guest chef Carol returns with a hearty recipe for New England Pot Roast. This delicious dish is served at the Liberty Tree Tavern in the Magic Kingdom at Walt Disney World! Is there anything better than a pot roast? Seriously, it’s a one-stop pot filled with nothing but love and gravy!!! 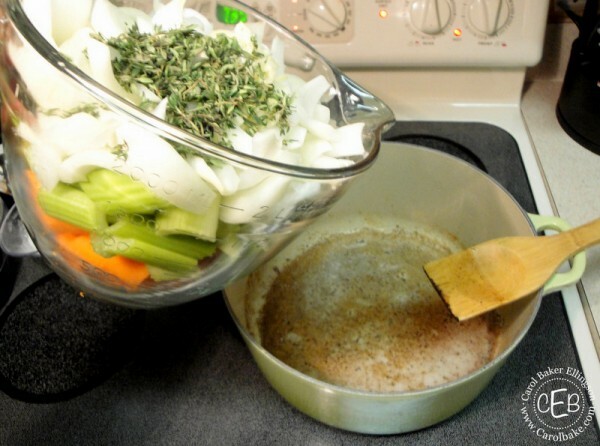 Picture it, a beautiful roast surrounded with perfectly tender carrots, onions, celery, garlic, and thyme all married together in beautiful gravy made from butter, wine, and stock then served over mashed potatoes…sign me up please! Is your mouth watering, yet? Mine definitely is!!! 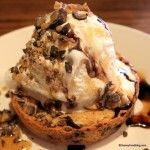 You can try this delicious dish at the Liberty Tree Tavern at Walt Disney World. There’s nothing like stepping back into time as you enter Liberty Square at Magic Kingdom Park. But, since most of us don’t actually live at the Magic Kingdom, you can also make this dish at home as those nice, crisp winter nights start to set in! Thanks to Cooking with Mickey and the Disney Chefs, we’re gonna break this recipe down step by step with pictures for you to make and enjoy at home. So, let’s get started! Step 2: Prep all of your veggies! 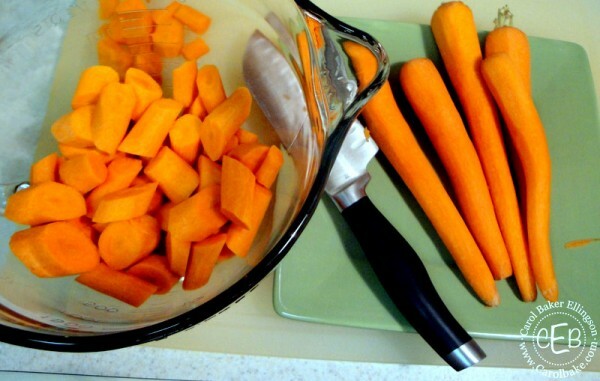 Clean, peel, and dice the carrots. Peel and slice your onions. 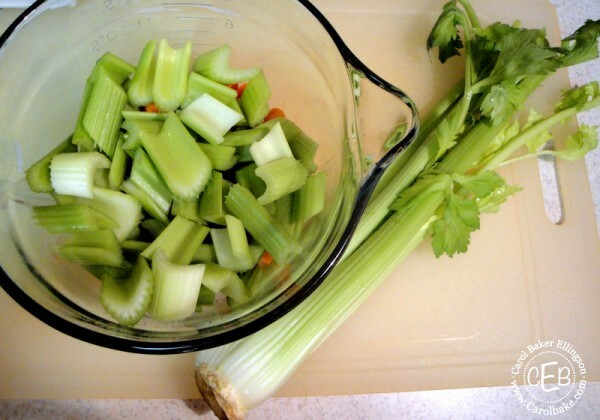 Place all of these prepped items in a large bowl, because they will be hitting the pan at the same time. 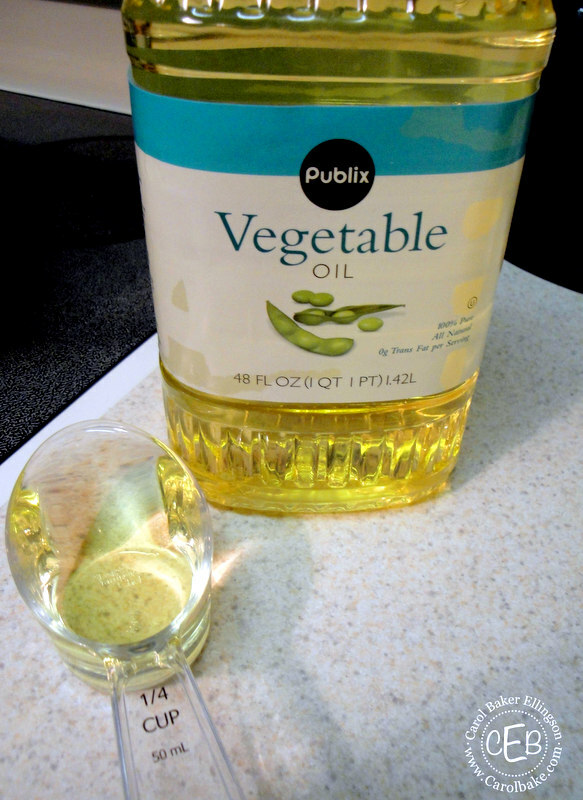 Step 3: Heat 1/4 cup oil in heavy pan. Pan should be oven safe and have the ability to be covered. Brown the meat on all sides. That will take about 2-3 minutes on each side. Do not let it scorch. 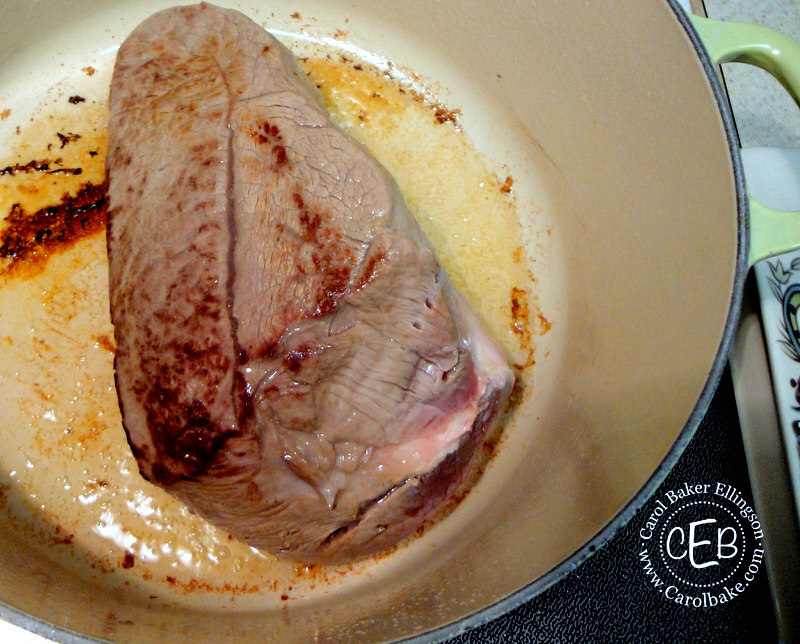 Step 4: Remove the meat once browned on all sides and set aside. 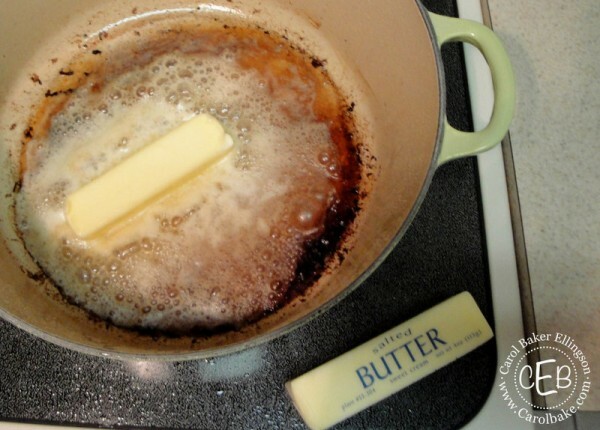 Step 5: Add the stick of butter to the pan. 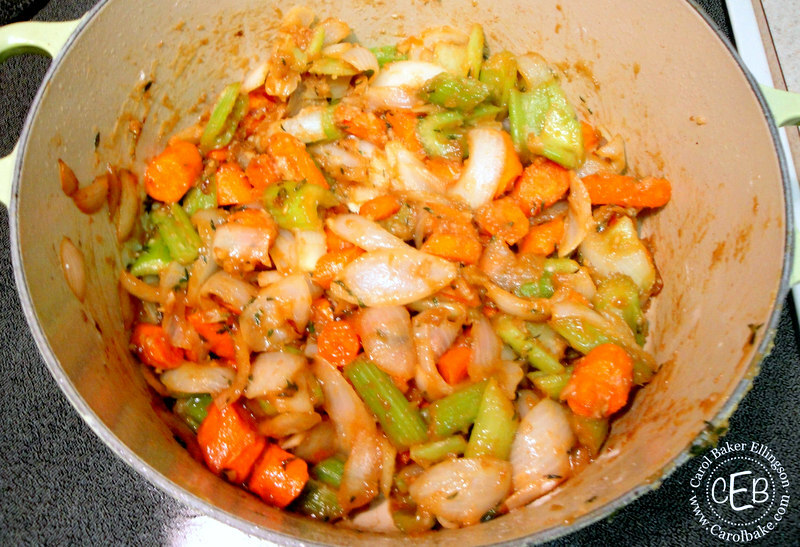 Step 6: After the stick of butter has melted, add carrots, celery, onion, garlic and fresh thyme. Sauteé until vegetables are tender. 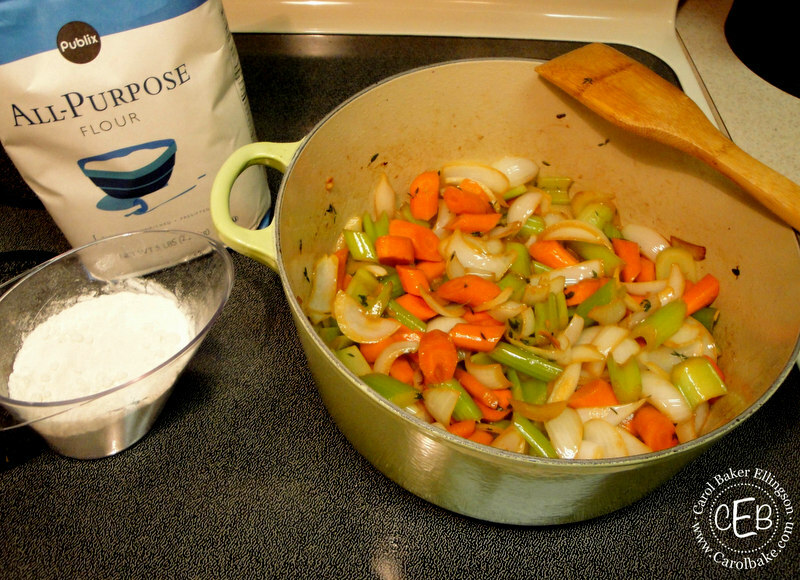 Step 7: Stir in the one cup of flour and continue cooking until flour is lightly browned. 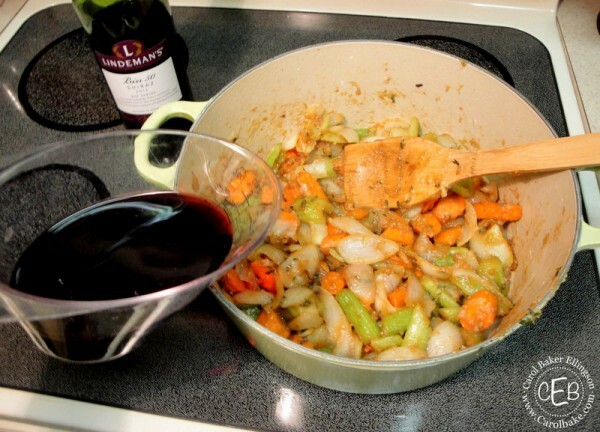 Step 8: Stir in the wine. Step 9: Stir in the beef broth. Step 10: Add the meat back into the pan. 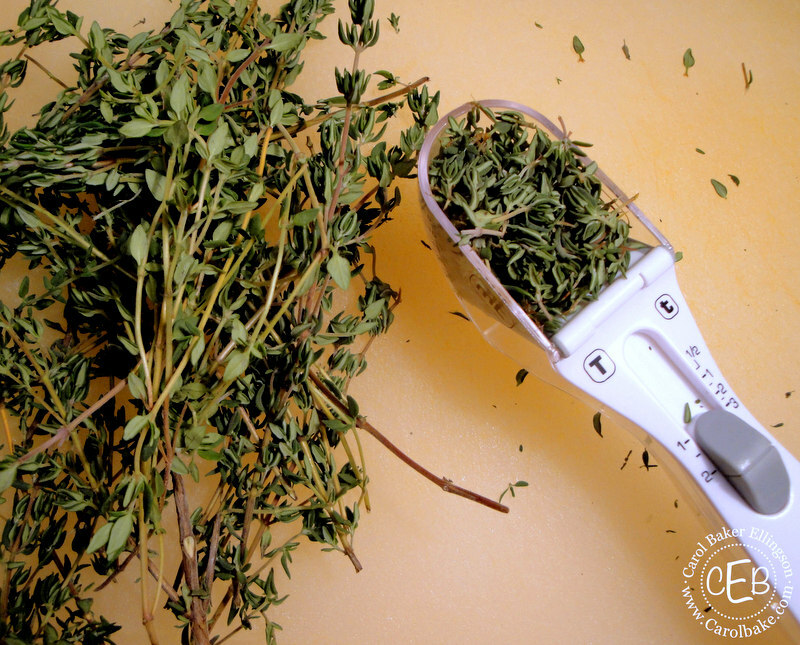 Step 11: Cover and bake for 40 minutes to an hour per pound, or until roast is fork tender. This dish is the perfect hearty meal to serve to your family. I can almost picture the colonists making this pot roast in New England to serve up for dinner. That reminds me, this is a great dish to get the kids involved. While you are cooking, you can put them to work looking up the history of New England colonists and how they cooked meals back then. Just wait till your kids find out that they didn’t have heat! 🙂 This is a great activity to keep them busy while you are cooking and makes great conversations at the dinner table while eating! 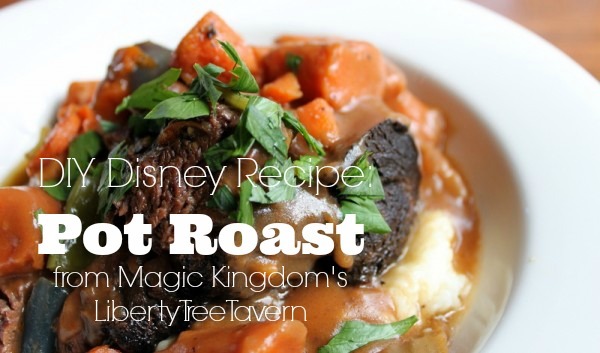 It’s also a great meal to make as you dream about your next trip to the Magic Kingdom! There you have it, dinner and your kids excited about a history lesson! What more could you ask for? I’d love to know how this dish turns out for you…just let me know in the comment section below! -The recipe said that this dish is great when paired with an Australian Shiraz, because the fruity aromas pair well with the flavors of this dish. So I used one cup of the Shiraz in my dish instead of the burgundy. That way, we had wine with our meal that really matched the flavors of the dish and I didn’t have to have two bottles of wine open with this one meal. -My butcher warned me that this cut of meat is particularly tough, and boy was he right! Be prepared to leave your pot in the oven for at least the hour it calls for and a little longer of possible. This is definitely a carving roast. 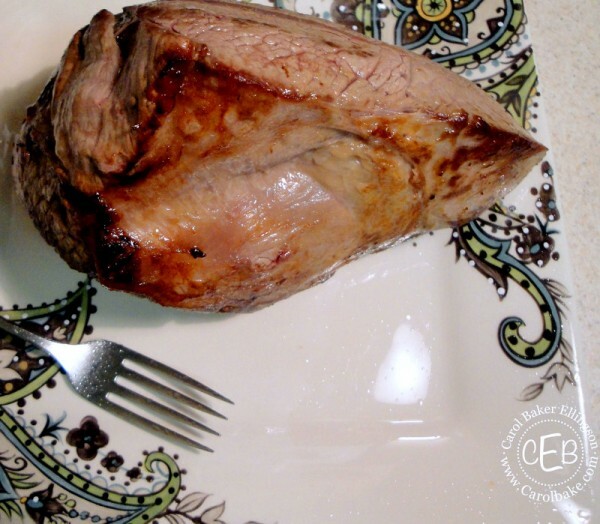 -From all my years of watching the Food Network, I have learned a thing or two about meat…it’s better to leave the meat out of the fridge for a little bit before searing. You don’t want the really cold meat to hit the really hot pan. That’s how it will scorch. As you prep the veggies, just leave your roast on a plate out on the counter. It’s also helpful to take a paper towel and pat down the meat to get rid of any excess moisture before sending it to the hot pan! What’s your favorite meal at the Liberty Tree Tavern? Do you have a favorite Disney dish that you make at home? Chime in! That looks good, but pot roast needs an hour of cooking for each pound of meat. I would try it at 325 degrees for 3 hours. Made this the other day for a party and it was a hit. Ellen is right though, need to cook it longer than the directions say. Or just go crockpot all day to be safe. 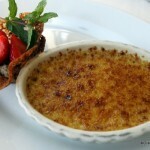 Ellen and Jay- I completely agree…I always follow the recipe exactly when I write these recipes. Like I mentioned toward the end, you’ll need the whole hour if not more…I ended up dumping our leftovers in the crockpot the next day and let that cook together all day on low…it was delicious:) The cut of meat this recipe calls for is also notorious for not being the most tender cut of meat! Phyllis- I’m not sure that would hurt it, but this gravy was definitely delicious! I agree about cooking time with a tough cut, slow and low is better. IF you want it more rare, buy a better cut of beef. My favorite meal at Liberty Tree is the turkey. I can still taste it from my last visit 2 years ago. Even my husband had it and loved it and he’s hard to please on something like turkey. We had planned on going back this spring but our dog had surgery so can’t leave for 10 weeks! I’m hoping in the fall for the Food and Wine Festival. Keep up the recipes. Love them plus the Disney cookbooks. We use the Food and Wine one a lot. 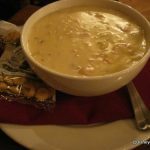 The Beer Cheese soup is a favorite. I agree the directions should read 40 mins to 1 hour PER POUND. OMG.. This is DELISH!!! I followed everything exactly as written till it got to the cooking part. I did everything up and then switched it to a slow cooker and cooked it on low for 7 hours. I haven’t even eaten dinner yet and it smells great and tastes great! I can’t wait to have this for dinner. I live in NE and THIS is a good NE pot roast recipe! I forgot to mention I used rice flour instead of reg flour to make this dish Gluten Free. 1/4 garlic? Is that 1/4 cup? 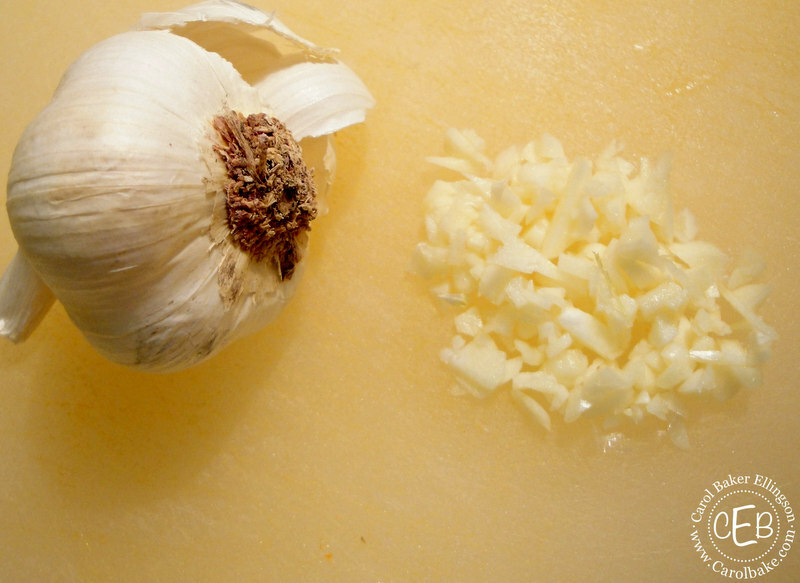 Rik — It should be 1/4 cup of chopped garlic. I’ve updated it. Thanks!! 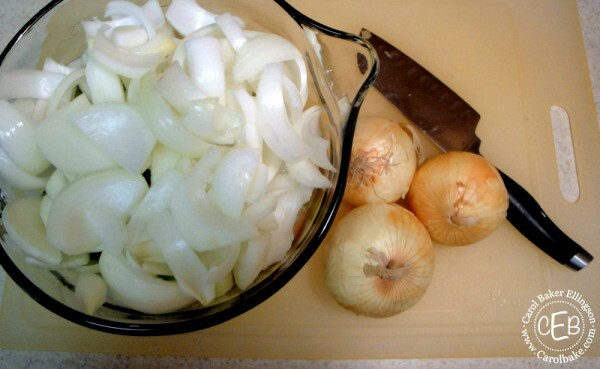 I also use pear onion and that give a delish flavor and I use Merlot instead because is mild flavor and use 3/4 of a butter sick and they come out perfect, and I used brown master to dark the gravy, I been doing this way a few times and always comes so good. 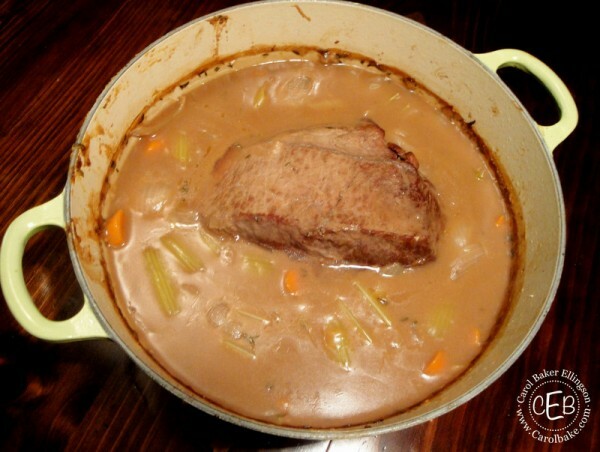 I sear the meat, then remove it from the pan, add the butter and vegetables soften them just to bit, then add the flour and wine and brown it slightly, and I put the whole thing and a large crockpot with the beef stock, and cook it on low for 6-7 hours. It’s so tender it falls apart. 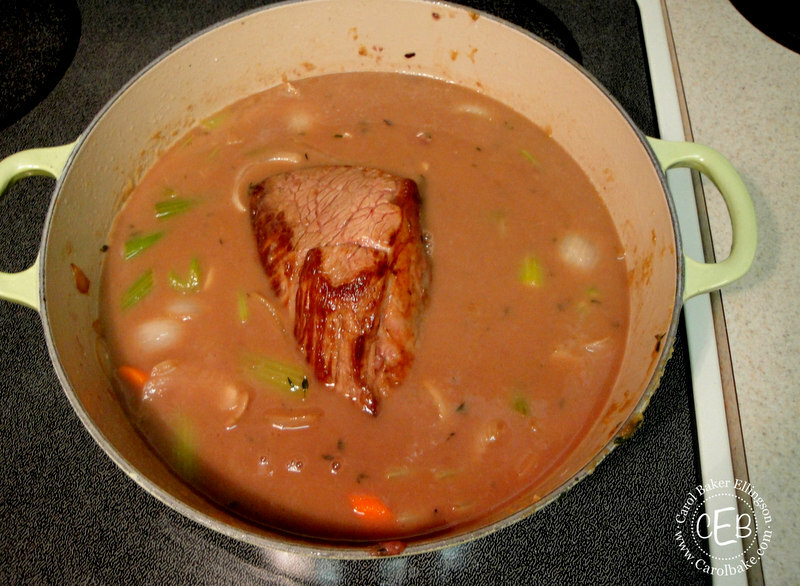 I also use a Chuck roast, it’s cheaper, but with the cooking time it comes out fork tender. 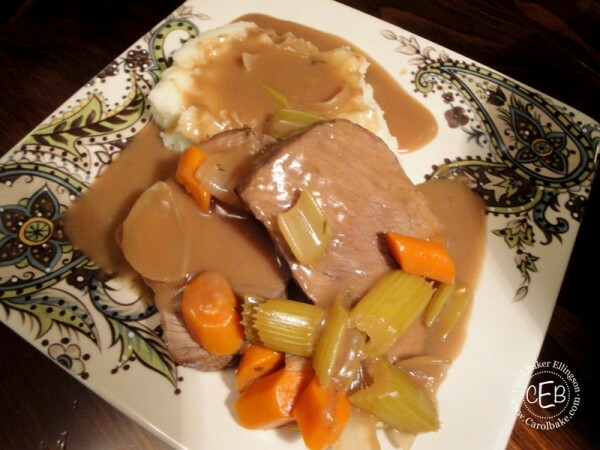 I have made this recipe a couple of times and, as is stated in other posts, it’s just impossible to achieve the tenderness of meat that you get in Liberty Tavern by cooking it for the time stated in the recipe. I had gotten a copy of the recipe from the Liberty Tavern itself, and, figured it must have been a typo. However, I checked it against the Disney Cookbook and the times are the same. I haven’t yet tried it for the ~7 hours as others have, but, imagine that would be all that would be needed for it to come out as tender as in the restaurant. The flavors are all good, just the timing is way off. No way can you cook a less expensive cut of meat like that in a short amount of time. It just won’t work. is there any way I can get the prep instructions for the turkey at Liberty Tree Tavern? It was so moist and delicious!! Best turkey I have ever had! One thing you can also do to make the meat more tender in the amount of time the receipe calls for is to cover the “pot” with plastic wrap and then aluminum foil. 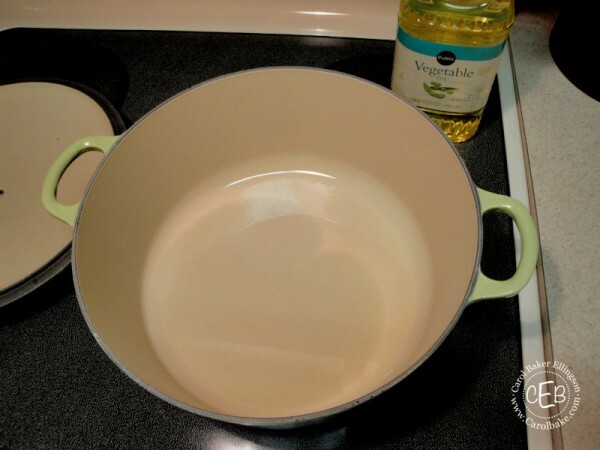 It will hold the heat in better than just putting a lid on the pot and putting it in the oven. The heat circulates underneath the plastic and foil and the steam will help to tenderize the meat. Works every time. Kathie — Thanks so much for the tip! I had the feast at The Liberty Tavern several times. I make it a must do everytime I’m in Disney. You’re right. The gravy is much darker in person. 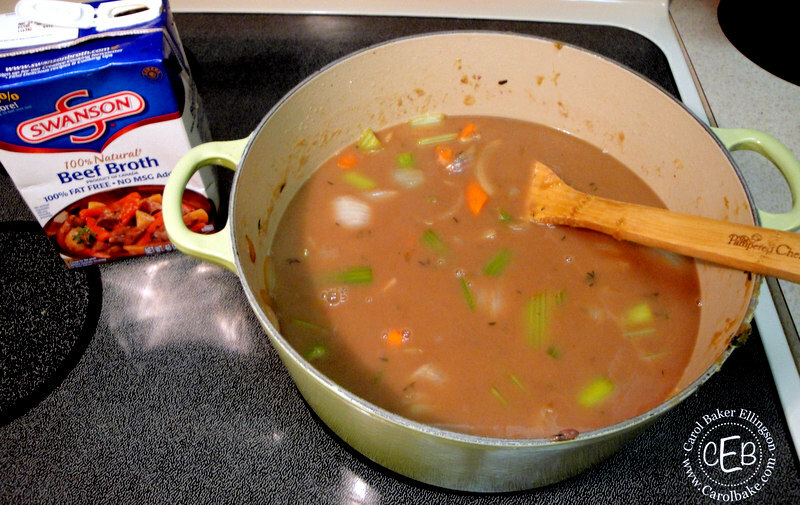 When I make it I use Kitchen Bouquet or Gravy Master to darken the gravy. I also bake it at 325* for about five hours. Now it’s fork tender without a choice. I made this recipe last night and the taste was spot on, but the meat was tough. After some further Internet research, I agree with several other comments, the recipe should read 40-60 minutes PER POUND of meat. This morning I cooked the meat for another 2 hours and it was FANTASTIC. 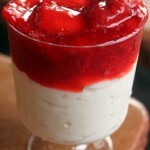 Please update this awesome recipe. Angela: Thanks for bringing this to our attention again. I’ve gone in and updated the recipe so it’s clearer. Glad you enjoyed it!